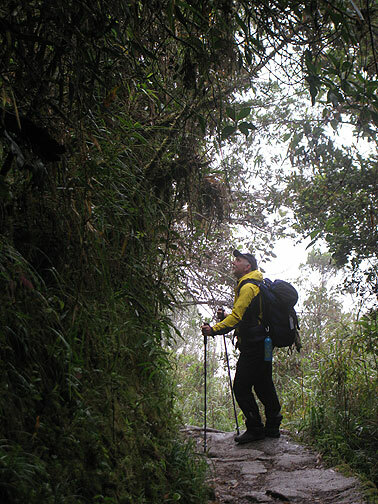 The trail can be seen skirting the flank of this high mountain terrain. I'm well above it where I took this photo. 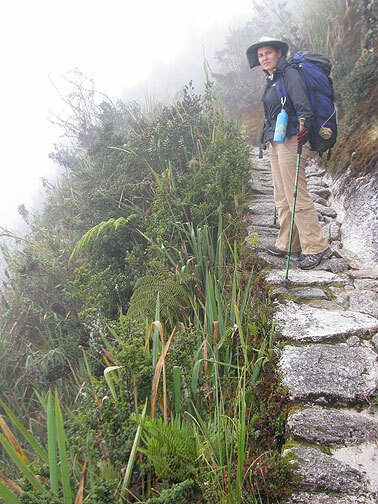 One of the few spots on the Inca trail where a "new" bridge was installed to compensate for a lost bit of the original trail... felt pretty darn precarious! 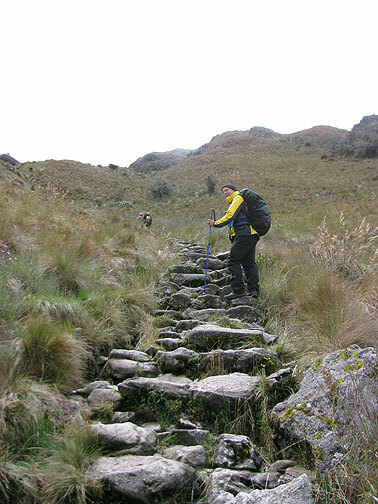 After the rather difficult first day and night, the rest of the journey was much easier. That’s not to say it was easy! Up and down we went. 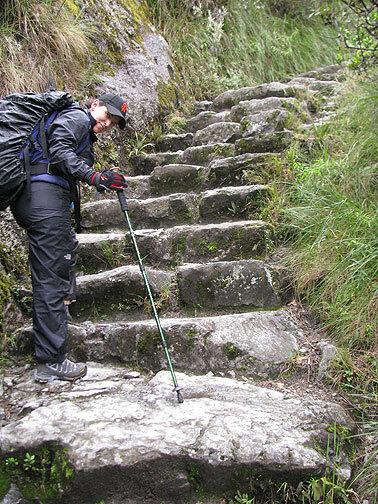 Day 2 saw us reach that first summit (in the last post) and then descend a long way to our lunch stop. Our crew, who you’ll meet a bit later in this entry, would always pass us by with their enormous loads of all our tents, camp gear, kitchen stuff, food, etc. 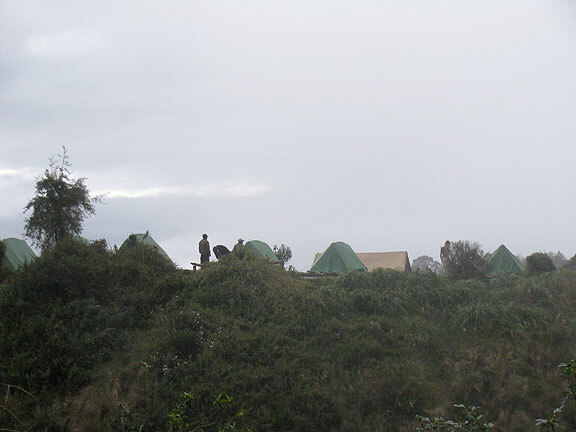 and then when we arrived at the lunch stop or our campsite for the night, everything was set up and ready! Now that was luxurious! 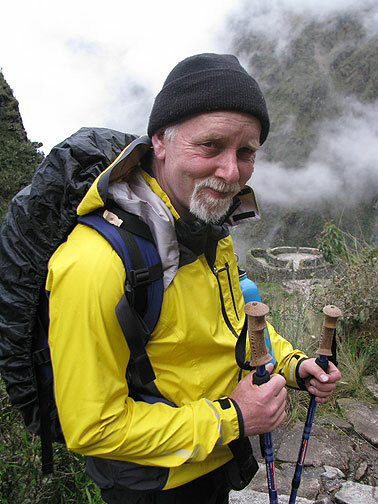 After lunch and a brief siesta, off we’d go again, and on the 2nd day it was back uphill again towards the 2nd summit, not as high as the first day’s but still over 13,000 feet. 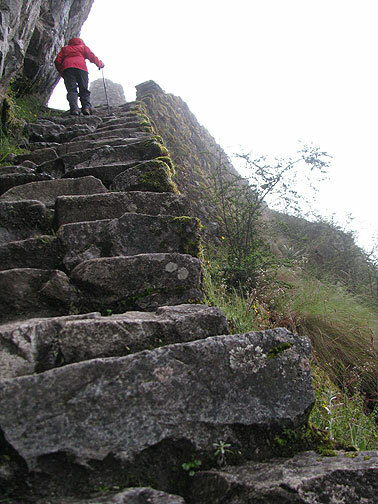 To get there we went up a long steep climb of original Inca trail that took us by a place called Runturucay, a round stone outpost that was probably a place to rest over night and a supply depot for travellers on the way to and from Macchu Picchu. 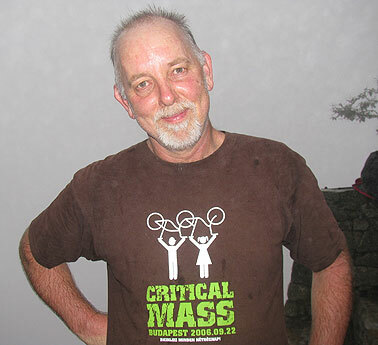 Eric sat us down when we reached it and told us about it in his wonderful historiographically aware way–that is to say, he understands that the typical histories we get are often rather distorted and often still controversial. 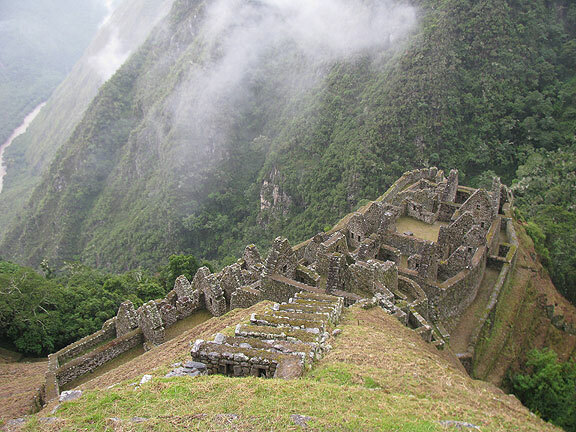 He had a fun tendency to use air quotes whenever the word “discovered” came up with respect to Inca ruins. 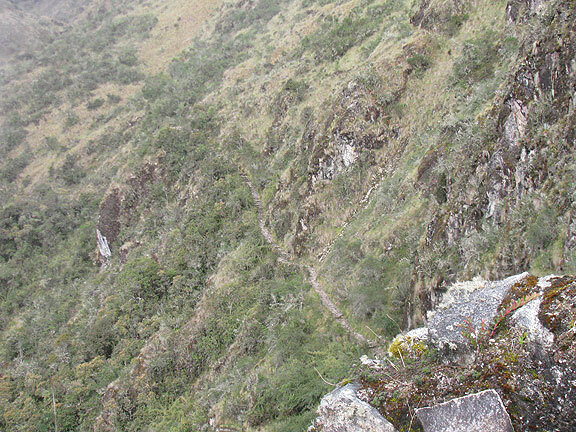 This is the Inca Trail ascending towards Runturacay. Had to prove I was there! We weren't moving too fast here either. Super steep, over 12,000 feet! 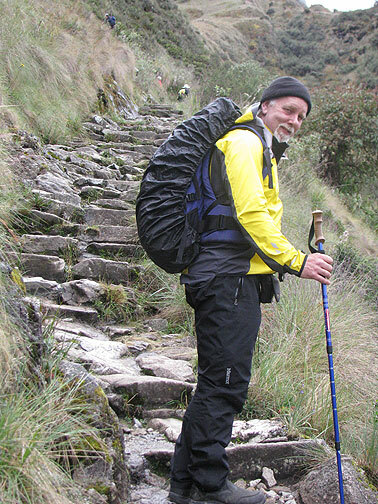 Climbing to 2nd summit, still a long way to go! 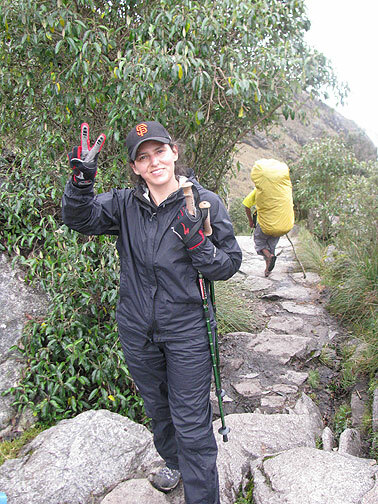 Adri celebrates our successful climb to the 2nd summit, 13,113 feet. 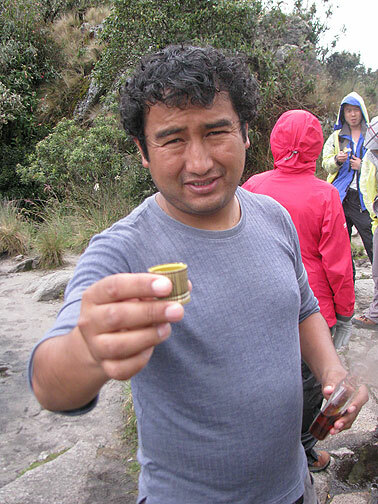 Eric invited us all to celebrate with a shot of pisco... hit the spot! 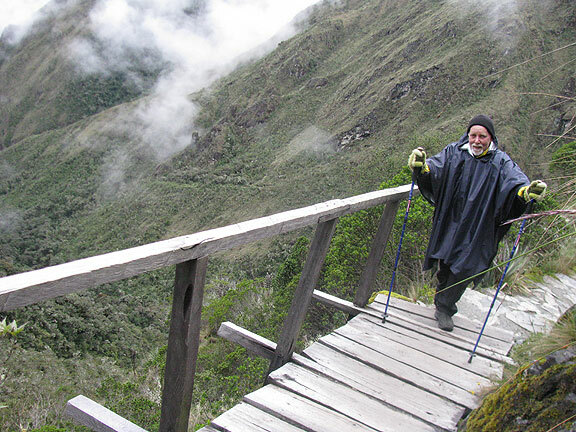 After the 2nd summit, it's about 3000 steps down, a real challenge for anyone's knees! 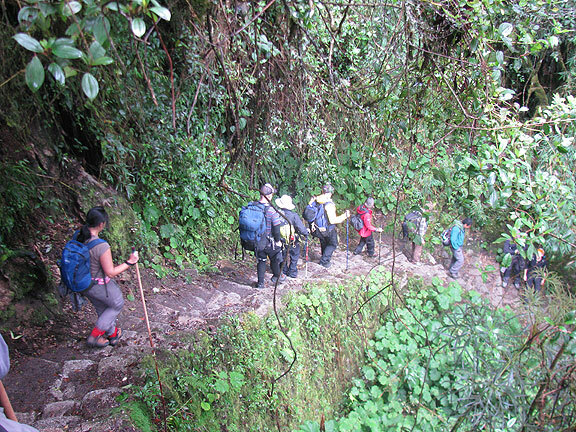 We didn't see a lot of wildlife, not surprising since the trail has 500 people a day walking on it (though we had the pleasure of going first most of the time, since our guide and team preferred to get up before dawn and beat the rush). 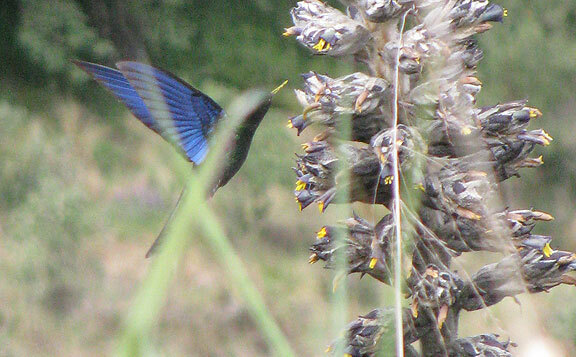 Here's a giant blue hummingbird, as big as a big robin. 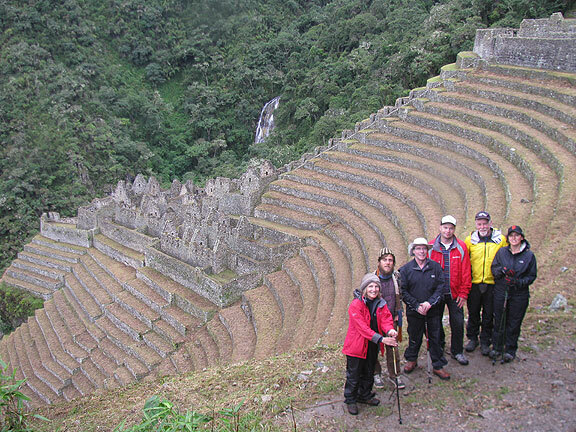 After many hours of hiking we came to the next amazing Inca ruin, Sayacmarca. Note the stairs climbing to it, which will be seen more closely in the next photo. 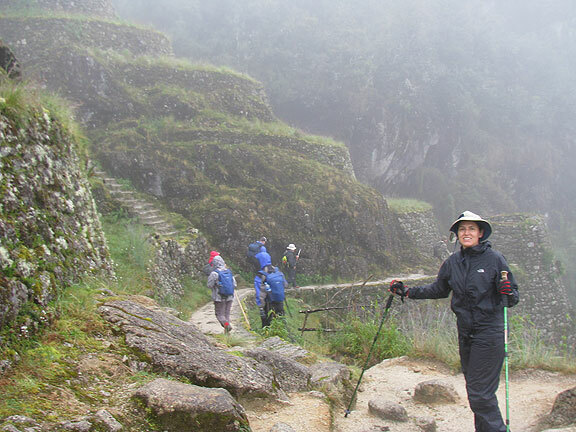 Sayacmarca was an "optional" side trip up this steep staircase, but we all did it, and were thrilled we did! 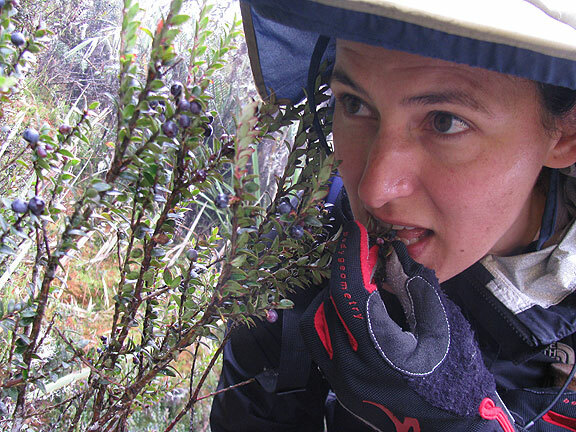 Sayacmarca turns out to have been at the meeting point of two or three Inca Trails. 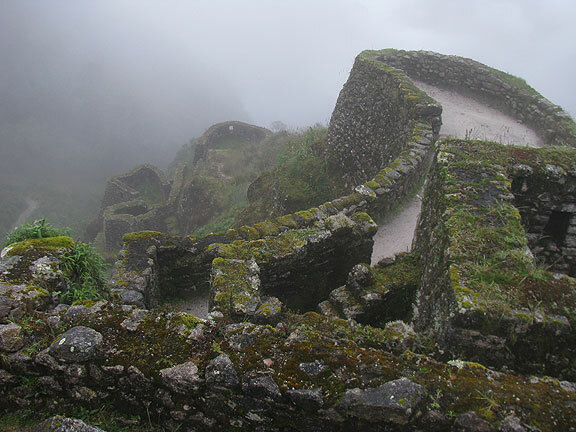 The one we came in on is still being used heavily by the tourist trade, but another one came up behind it from the adjacent valley. 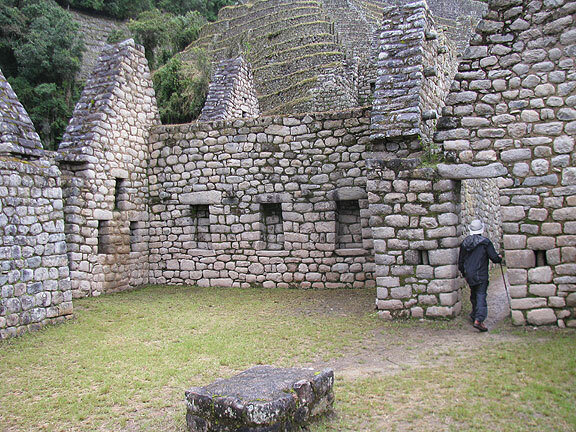 Sayacmarca straddled a key access point for people heading to Macchu Picchu and apparently a good deal of grain and other foods were stored here. 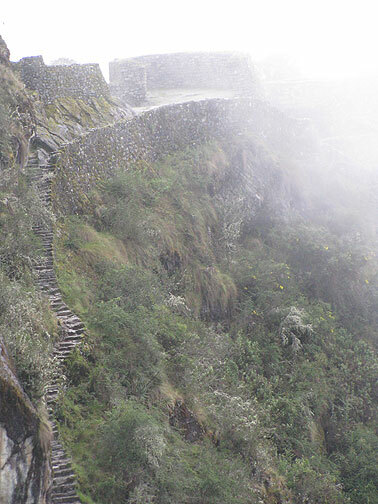 Here is the other Inca Trail that emerged from the valley at the other side of Sayacmarca's spot on a rocky promontory. 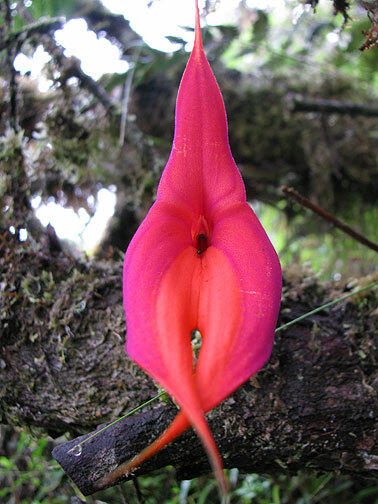 Sayacmarca. 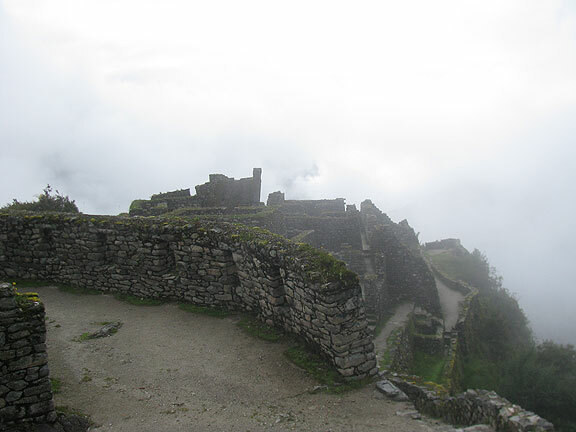 While we were there, the clouds swirled about and occasionally opened up to amazing vistas. I suppose that was pretty typical for the folks who lived here thousands of years ago too. Enjoying the view out from Sayacmarca. 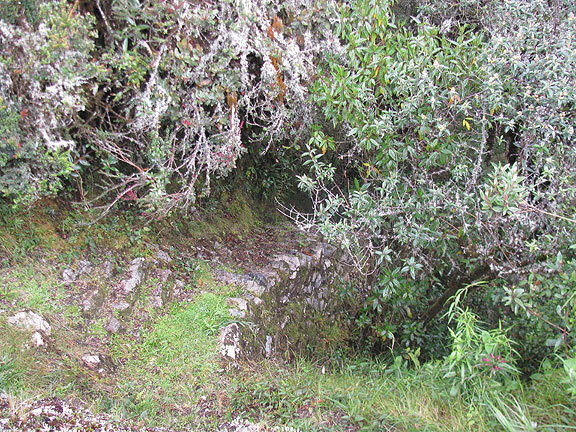 A very sophisticated aqueduct system (seen on the wall at left) brought water down the mountain and channeled it to this important Imperial checkpiont. 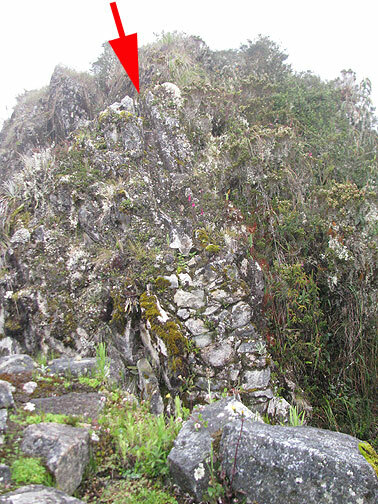 The arrow indicates the channel carved into the adjacent ridge that brought the water over a now-missing piece of the aqueduct. 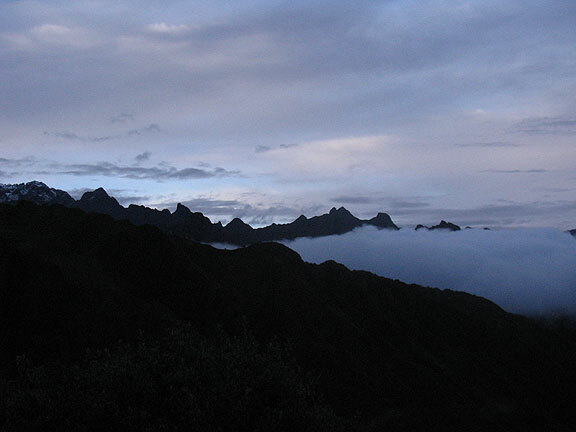 Overview of Sayacmarca with swirling clouds. 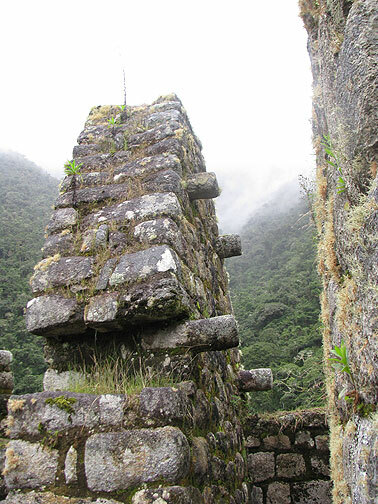 We wandered the ruins for a good 45 minutes, transported into a distant time, before we resumed our trek down towards the cloud forest. 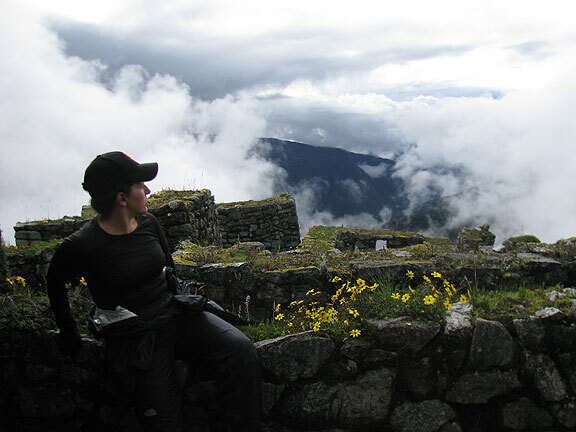 The beauty of this hike was encountering the ruins along the way, experiencing with our feet and pounding hearts the extensive network that had been built by the Inca Empire. Here’s a map I borrowed from Charles Mann’s great book “1491” which also provides a fantastic description of many pre-European cultures and how sophisticated they were. 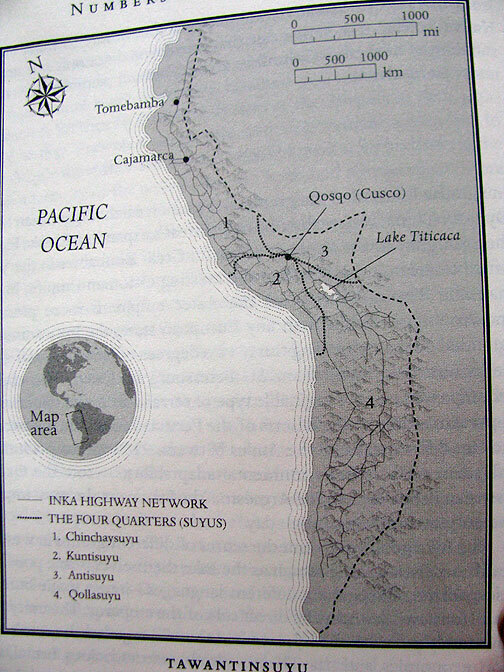 The Inca Empire stretched from southern Colombia in the north, through Ecuador (Tomebamba near the top of the map is today's Cuenca, Ecuador) and Peru, south to Bolivia and Chile (in terms of today's political boundaries). 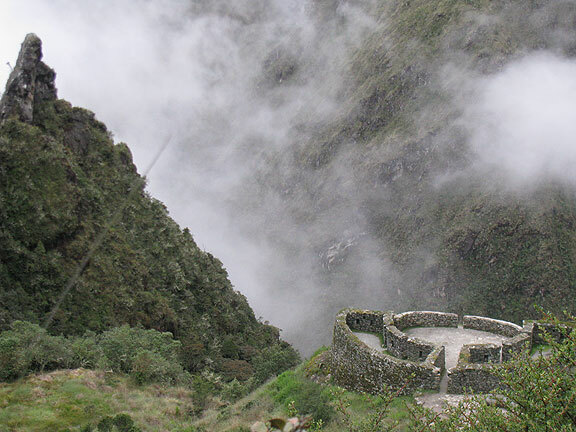 The empire was joined together by the road system that today's Inca Trail is a remnant of. 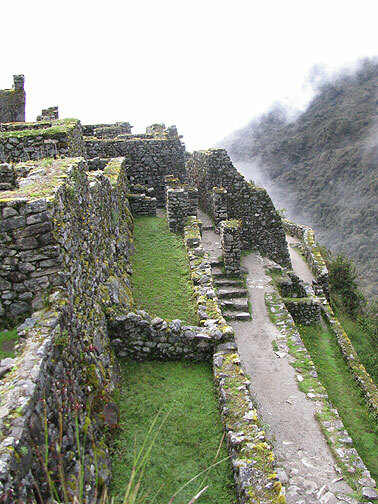 The Incas had a road system roughly equivalent to that of the Romans, and it covered thousands of miles too! 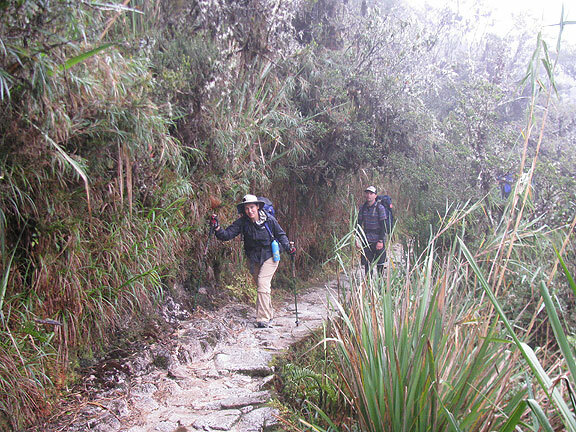 Down and down we went, and soon we were well into the cloud forest, which is basically the tropical rainforest at a high altitude. We paused here to listen to an orchestra of frogs. Sometmes we had to go up again, but mostly it was down at this stage. A picturesque bit of drooping bamboo. 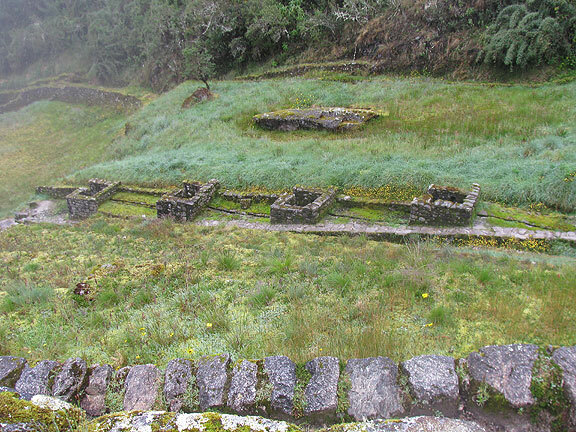 This ruin at the bottom of the valley, Phuyupatamarca, had this remarkable set of running baths. 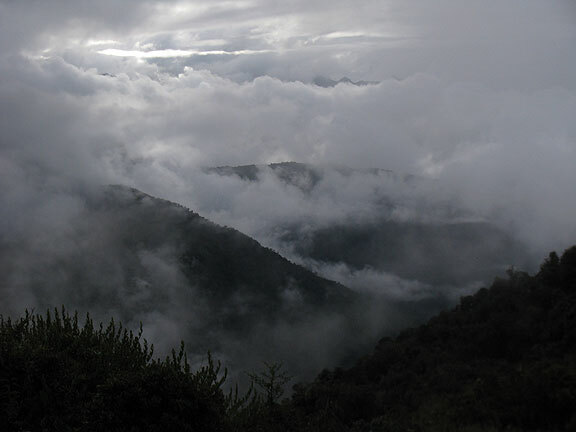 Now we're fully in the cloud forest and it's getting warmer in addition to being quite humid. Not long after this juncture we arrived at our campsite for day two, a beautiful spot with incredible views. If only it had been crystal clear! As always, everything was ready for us when we arrived. 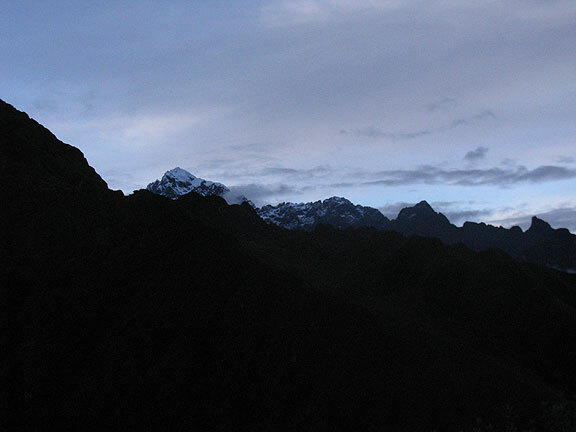 As night fell, this was the view from our tent. 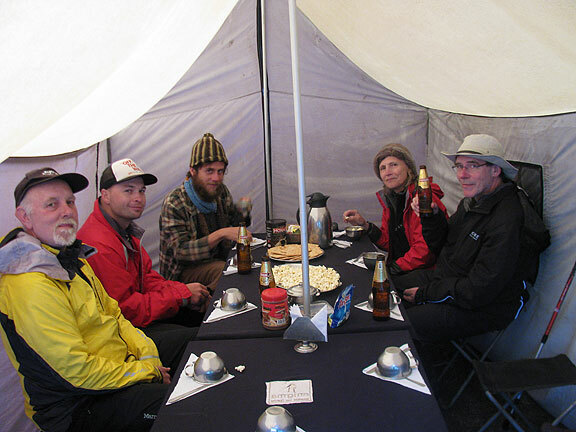 Our dining tent, where we were served a steady stream of great meals throughout the trip. 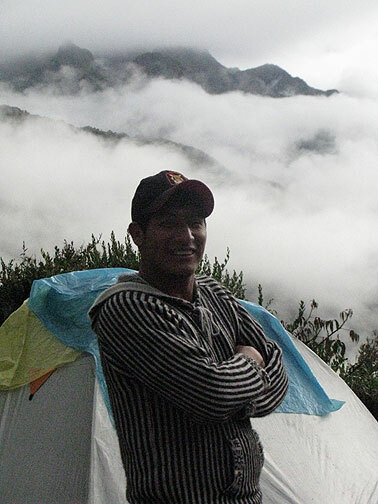 Hilario was our awesome chef, and he was as jovial as his name might suggest. Eric was good about getting us all to meet each other and exchange at least a bit about ourselves, mostly if we were single or married, how many children we had, what we did when we weren't on this trip. 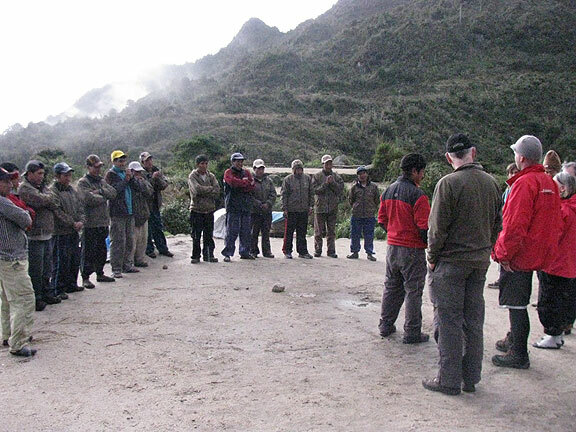 The porters were all from local villages in the mountains, some had been doing it a long time, but most had only been portering for a few years. 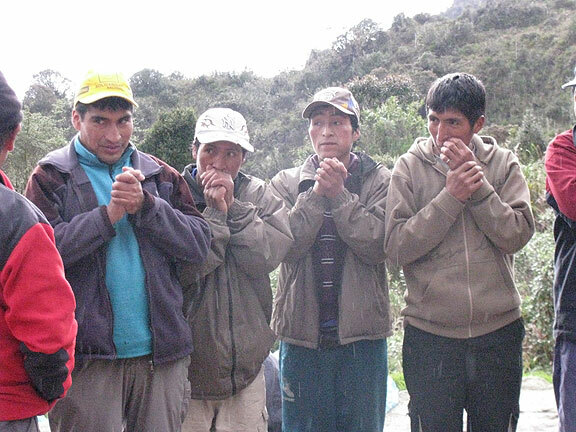 We learned they were paid about 180 soles for the whole time, the minimum wage (which was considered better with this company than others, apparently) but that isn't a lot more than about $70 for the 4 days of hard work! We all tipped them $10, so they split another $80... still not too good. 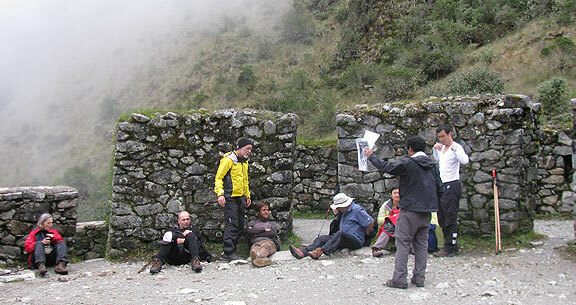 It was chilly, and a bit awkward for everyone, as we went around telling our stories. 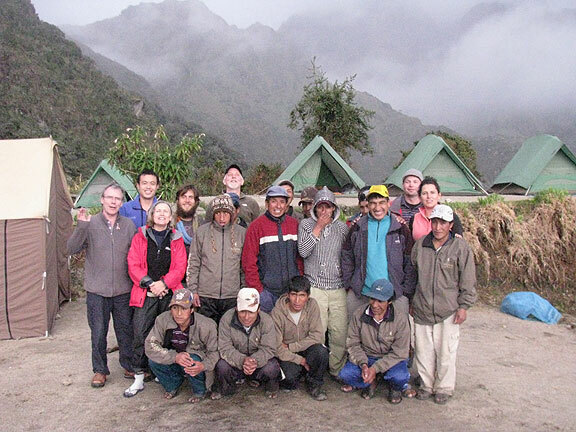 "Family portrait" at 2nd campsite... all the hikers and porters together. We awoke at dawn the next morning to relatively clear skies, but they clouded up in less than an hour. 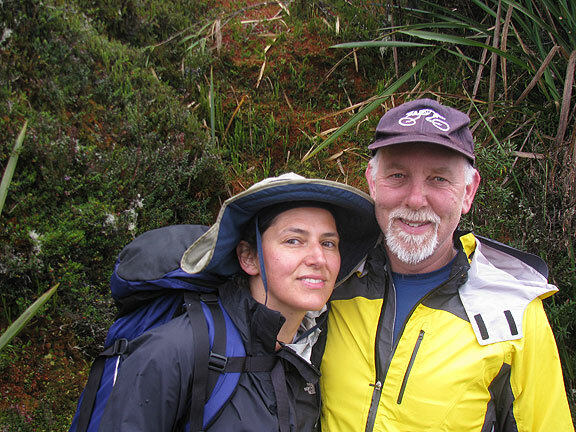 We were bummed not to get a glimpse of the big snowy mountains that are sometimes visible on this hike. 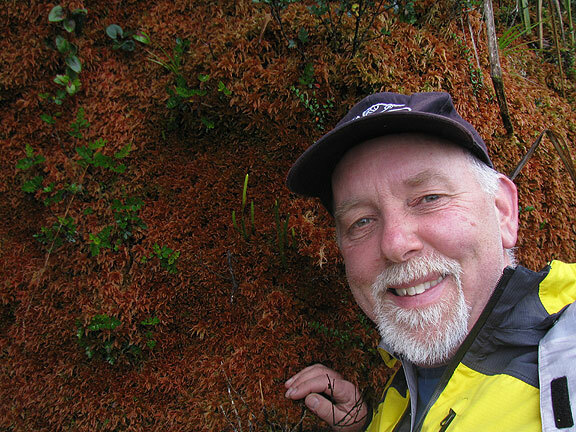 Day three was an even easier hike, and we spent a bunch of it hunting for wild orchids along the way. 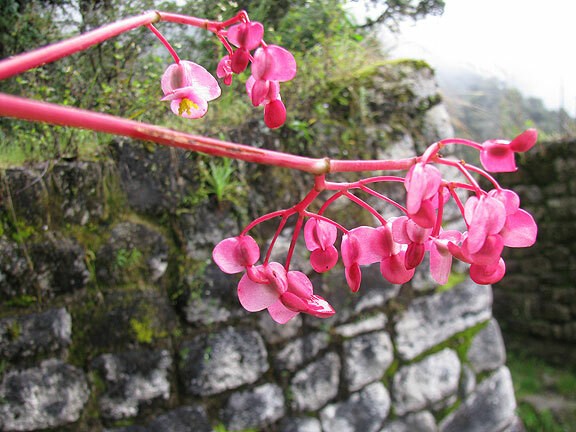 Begonias like these were common, but it was harder to find orchids. 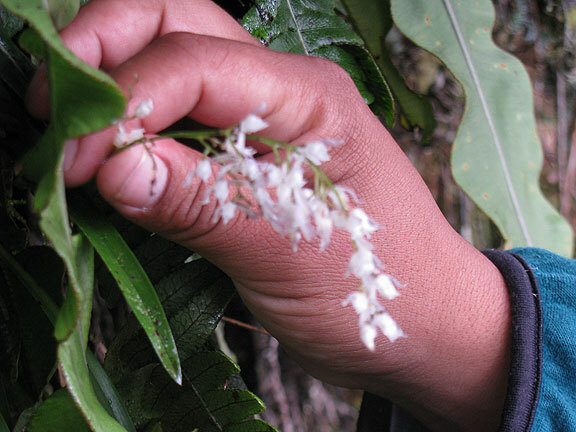 Eric helped us find a bunch eventually, these tiny white ones being but one of the many varieties. 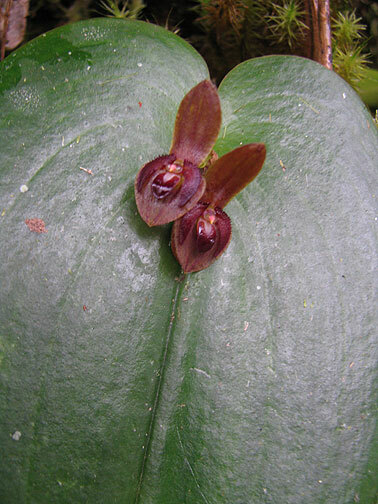 Tiny orchid on giant leaf! 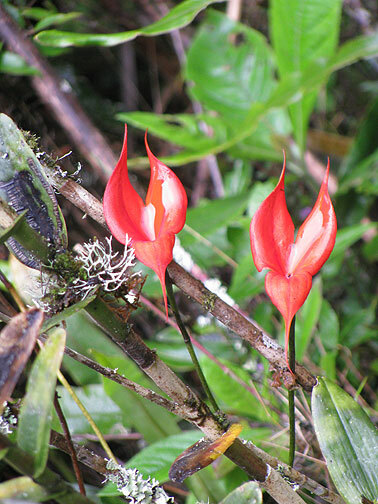 These orchids are important to the culture in the Andes, but I've forgotten their name! 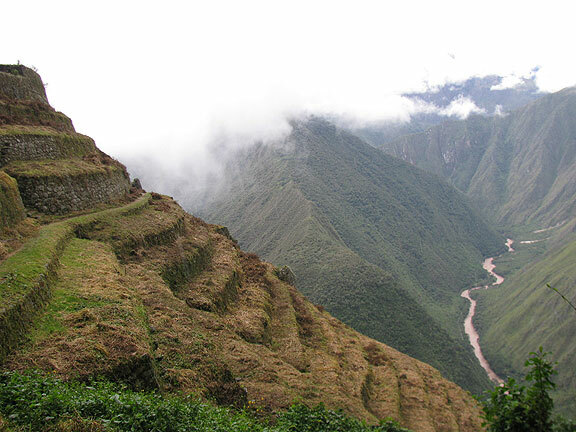 The Urubamba River is visible in the distance, far below this large terraced slope. 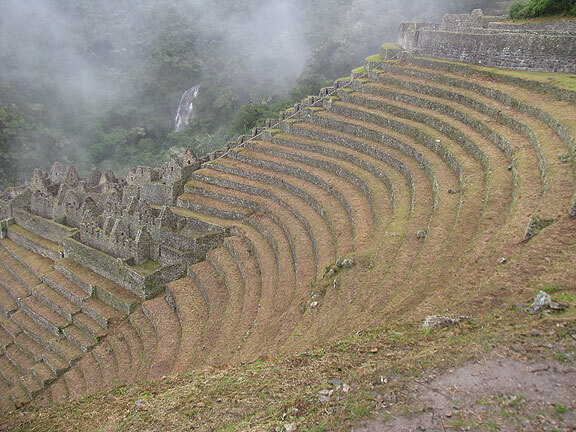 This was the look back at these same terraces after we'd hiked down through them. Here's Adriana making her way down the stairs. 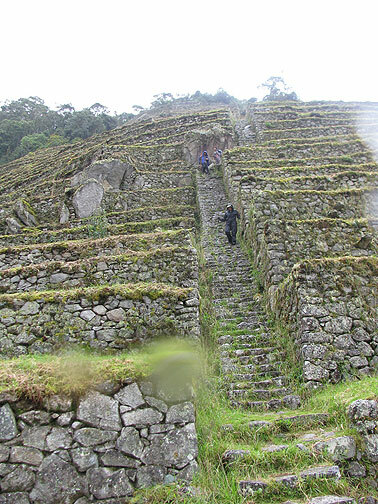 From these terraces we skirted through the forest to arrive at the campsite Wiñay Wayna, where ALL the tour groups land on the night before their permit allows them to enter Macchu Picchu. 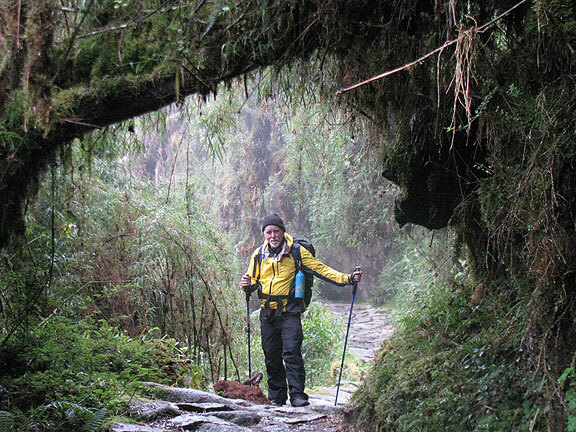 So it was the end of our private journey, quiet camping, pretty isolated experience of the Inca Trail. Thanks to Eric and Enigma for that! 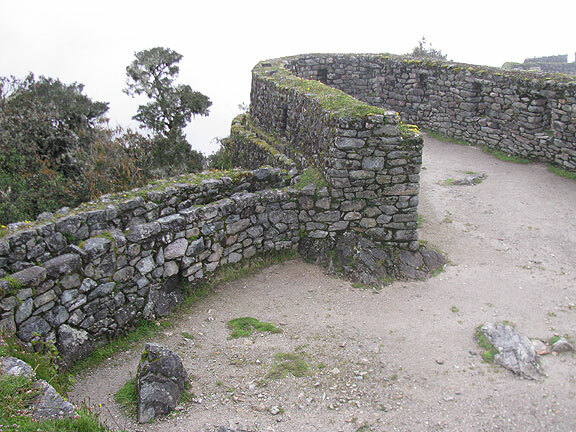 Because after this evening it would be a busy trail full of people… but before we awoke before dawn to get a good spot in line to go through the door to the final leg of the journey, we had the pleasure visiting one of our favorite ruins, a short distance from Wiñay Wayna, called Inti Pata. It was stunning! 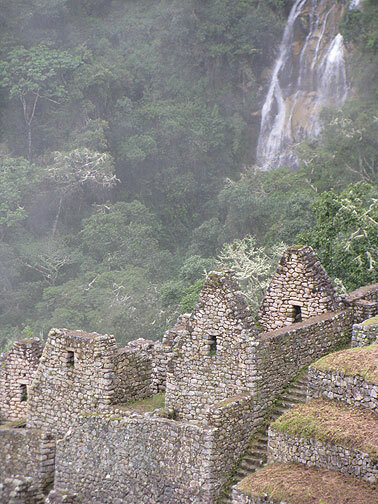 Looking straight down on the dwellings of Inti Pata, with the Urubamba River at far upper left, thousands of feet below this settlement. Inti Pata with waterfall in distance. 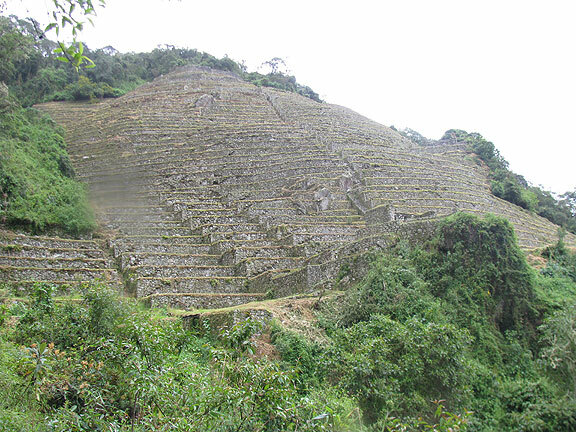 Inti Pata housing, apparently once enough for about 500 people who maintained the extensive agricultural terraces surrounding it. 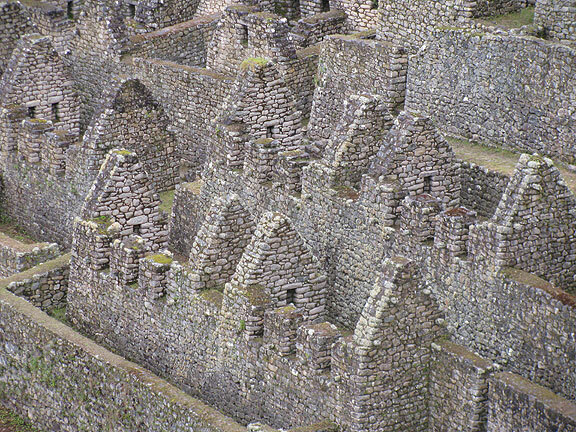 The roofs are long gone, but the structures that bore them are super well made! Interior courtyard in Inti Pata. Another "family portrait" at Inti Pata. 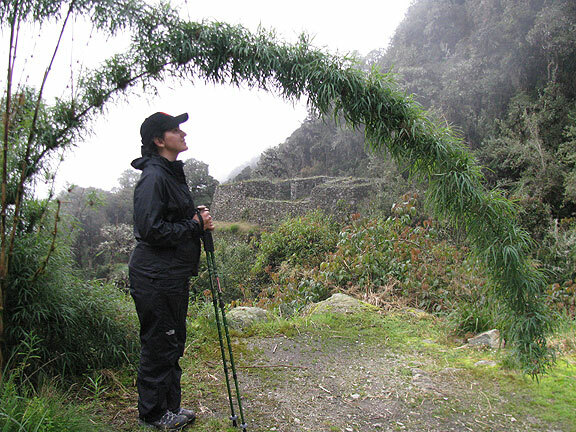 Here I am in the pre-dawn fog, waiting for the gate to open to let us hike to Macchu Picchu. 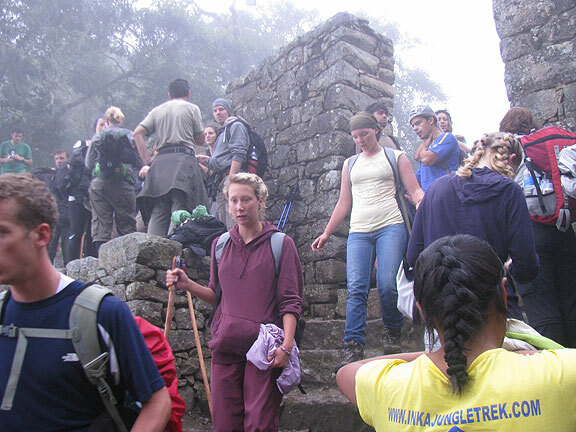 The famous Sun Gate should be the spot where you catch your first real glimpse of Macchu Picchu, but it was still fully fogged in as we reached it... and quite a few others got there around the same time, quite the traffic jam!